Money-saving advice for the budget traveler in Cusco. Cusco, Peru, often acts as a base for visiting the iconic Machu Picchu. While this wonder of the world is absolutely worth the trip, the unique charm of Cusco itself is often overshadowed by this famous site of ancient Inca civilization. Cusco represents a lively cultural hub of southeastern Peru, where tourists, locals and alpacas alike can mingle in the rickety stone streets. The affordability of this South American city also invites travellers to stay longer than planned. Backpackers often find themselves infatuated with Cusco’s vibrant energy and abundance of things to do. For those who want to really experience Cusco, rather than just stop over for a night en route to Machu Picchu, here are some tips for making the most of this city while on a budget. Perfect for meeting new friends, sleeping in comfort, and living close to the city center, hostels offer great accommodation for cheap prices. A Cusco favorite is Milhouse Hostel, located just a couple streets away from the city’s main square. This social hostel has a free buffet breakfast, a gorgeous sunny courtyard, and a comfortable atmosphere, all for only 36 Peruvian Soles per night. Cusco’s nightlife supplies nonstop fun as well as affordability. Party hostels, such as Milhouse, offer discounts and free drinks at some amazing dance clubs. Most nightclubs, like the popular “Chango”, are centrally located and therefore walking distance from many places in the city. Another perk of Cusco is the safety of the streets, so as long as you go out partying with a few friends for company, walking should never be a problem. Hostels often have their own bars as well, like Loki Hostel, so backpackers often don’t even need to leave the hostel for a great night. The textile industry brings income, color, and soul to the city in the form of rainbow patterned goods. No traveler leaves Cusco without buying an Alpaca sweater or two, and there is no shortage of places to shop for souvenirs. Some of the best prices reside at Asunta Market, a shop run by extremely friendly people, where the shelves literally overflow with gorgeous handicrafts and clothes. Shopping here, and at other similar little shops scattered in the side streets, is much more economical than shopping near the main square, Plaza Del Armas. This area is crawling with vendors trying to sell drawings and trinkets to tourists at inflated prices, so stay clear of the overly crowded, touristy spaces when buying souvenirs. For transport within Cusco itself, taxis work out to be the cheapest and easiest method of travel. For example, a 15 minute taxi ride from the airport to the city center is only 10 Soles. On a broader scale, using public transport between Cusco and other cities or even other countries is also easy and affordable. When traveling from Cusco to either Arequipa, Lima, or Puno, visit Terminal Terrestre, the city’s main bus station, to purchase cheap tickets for one of Peru’s comfortable coach buses. To visit various points of interest outside Cusco such as the Sacred Valley and Rainbow Mountain, walk to a designated pickup location in the city and take a collective van with other travelers. For authentic Peruvian cuisine that won’t challenge your budget, choose local street markets for lunch rather than dining out at a touristy restaurant. Head to San Pedro Market for snacks like fresh fruit, bags of nuts, smoothies, or sandwiches of meat and cheese. Explore San Blas Market for a larger meal, where you can find “almuerzos” for only 7 Soles. These meals usually consist of a fresh juice or tea, quinoa soup, and a main course, and San Blas Market has traditional as well as vegan or vegetarian options. For museum lovers, Cusco has a Potato Museum, Chocolate Museum, and a Textile Museum all free to enter. Rather than paying to enter a fancy art museum, simply wander the streets and stroll though all the open art galleries and painting shops that have beautiful Peruvian artwork on display. For more free cultural insight, visit the Basilica Cathedral of Cusco and admire the grand religious art and delicate design. For a more active afternoon, hike uphill to the towering Cristo Blanco Statue and enjoy a stunning view of the city and surrounding mountains. The path up to Cristo Blanco is not clearly marked, but any local you meet on the way will be happy to give you directions. The easiest way to visit attractions like Machu Picchu, the Sacred Valley, and Rainbow Mountain is undoubtedly through an organized group tour. Rather than booking a tour online in advance, speak to someone at an actual tourist office in Cusco. Talking to the locals leads to a much better deal on tours than searching online, and countless tour operators have offices in every corner of the city. 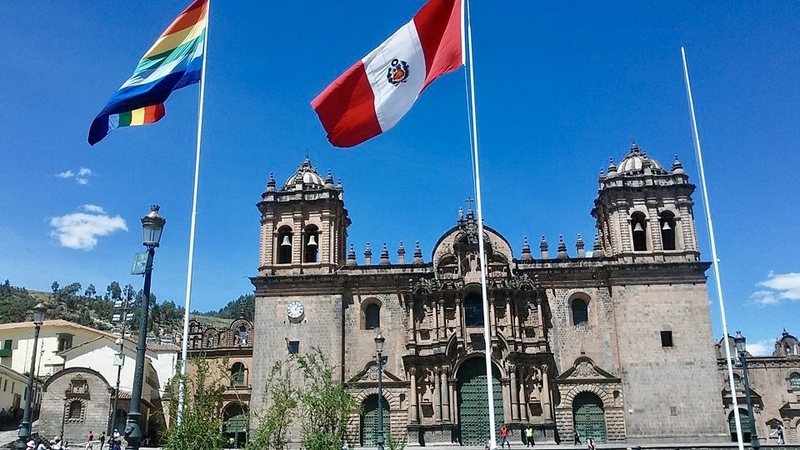 For example, a one-day hike to Rainbow Mountain can cost around 200 USD online, whereas one of Cusco’s many tourist offices will offer the same hike for roughly 30 USD. The only exception to this would be visiting Machu Picchu during peak season, in which case tours should be booked a few months in advance. Using these tips, backpackers will find that Cusco is not only bursting with picturesque sights and welcoming locals, but is a very affordable destination. Instead of speeding through, take your time here. Wander through the hilly streets, browse through the chaotic craft stores, strike up a conversation with a shop owner and practice your spanish. Visit the Cathedral during morning mass and watch Peruvians gather in celebration of faith. Chew coca leaves in hopes of adjusting to the extreme altitude. Share stories with other travelers in a hostel common area. Enjoy every second of life while visiting Cusco, and you may find that this city exceeds expectations and even rivals the hype of Machu Picchu.